Inon Barnatan, born in Tel Aviv 33 years ago, has achieved a big international reputation since he moved to New York in 2006, and listening to him in Durban it was easy to hear why. Playing for the Friends of Music at the Durban Jewish Centre, he showed that he is not only a virtuoso with an impeccable technique but that he is also a sensitive and poetic interpreter of the music he presents. He is also an engaging and unpretentious personality. His choice of programme - Debussy, Mendelssohn, Ravel and Schubert - revealed his temperament. This was music for the connoisseur, difficult and taxing but not empty showmanship. He opened with Debussy’s Suite Bergamasque, four pieces written about 1890, when the composer was a young man. One of them, Clair de Lune, Moonlight, is very famous. The others are seldom played. They are delightful and they were performed by Inon Barnatan with delicacy and sympathy. Then came a very well-known work, Mendelssohn’s Andante and Rondo Capriccioso. The main part, the rondo, was marked Presto, very fast, by the composer. I have never heard it played faster. Barnatan has an exceptional keyboard technique, and he used it to dazzling effect in this lovely, graceful music. “It took my breath away”, a member of the audience said to me afterwards. Yes! More mind-boggling virtuosity came with Ravel’s La Valse, the composer’s piano transcription of his celebrated orchestral work. This was a brilliant and totally compelling performance. The main work of the evening was Schubert’s Sonata in A major, D. 959 (the D stands for Otto Deutsch, who classified all Schubert’s works about 70 years ago). Schubert wrote about 20 piano sonatas and they were sadly neglected for many years. In recent times they have, however, been recognised for the masterpieces they are. The three last sonatas, his finest, were written only a few months before his death in 1828 at the age of 31. D.959 is the penultimate sonata and it is a wonderful work. The strong, decisive opening Allegro is followed by a melancholy Andantino that develops into intense drama. Then comes a bouncing Scherzo and, finally, a Rondo that is a long, unending stream of beautiful melody (the main tune was a favourite with Schubert; he used it in another sonata). 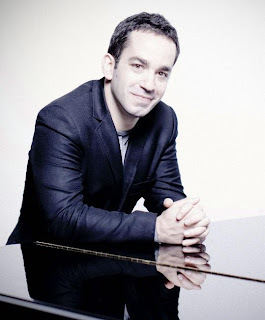 This long sonata - it runs for about 40 minutes - was given a commanding interpretation by Inon Barnatan. He played with power and authority and with superb tonal contrasts. It was a privilege to listen to this performance.